Everyone has a place that brings back great memories and holds a special place in their heart. For me, that place is Florence, Italy. Ten years ago in 2004 I studied abroad and lived in Florence for five months, and I remember that time as an eye-opening experience that exposed me to new languages, cultures, and really solidified my passion for good food. For my 30th birthday I could think of nothing better than heading back to the city that I love so much to celebrate the start of a new decade of my life. It's hard to have a bad meal in Florence, but some of the spots I highlight here are not to be missed. As they say in Italy, "Buon Appetito!" When you're milling around downtown Florence and happen to be just steps away from the Duomo, Coquinarius is the perfect place to stop to enjoy a great meal. We dined here 3 times while in Florence, and I think this is the best lunch the city has to offer. Coquinarius is a wine bar and restaurant that offers an incredible selection of salads, crostinis, pastas, and meats. The walls are lined with wine bottles, brick, and there are beautiful archways throughout the interior. The staff is lovely, and incredibly helpful, and they made my 30th birthday very special with their wonderful food and great hospitality. Some highlights here are the breasaola salad with arugula and Parmesan, the crostone with Taleggio and honey, the eggplant rollatini, and the pear and cheese ravioli. The ravioli is slightly sweet and topped with a soft butter sauce and lots of cheese. It is to die for. We also loved the bottle of Bellenda Prosecco, and I could not imagine going back to Florence and not eating at Coquinarius. Add it to your list! Coquinarius is located at Via delle Oche, 11r. 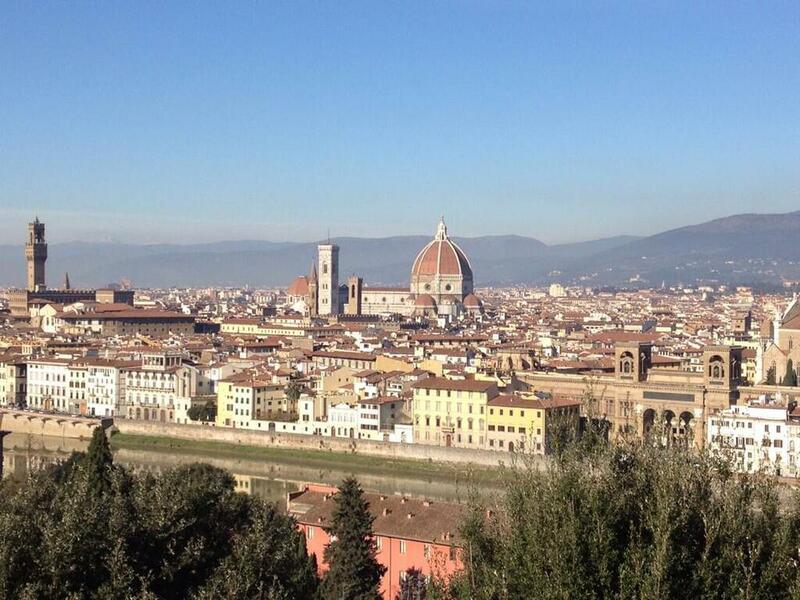 My friend and I decided to check out the Pitti Palace and the Boboli Gardens one afternoon. I highly recommend you spend time in the gardens and climb to the top to get a killer view of the city. After working up a sweat, we walked just a few blocks over to Trattoria Quattro Leoni, which was a place I remembered from my days back in 2004. It was just as charming and wonderful as I had remembered. White lights strung throughout the small and cozy restaurant, and big tables of families enjoying great food and each other's company. We dined on meats, crostinis, and I decided to be indulgent and ordered the taglierini with white truffles. It was homemade pasta with large truffles shaved on top to perfection. The salad with avocado, pesto, and pinenuts was beautiful, fresh, and delicious. We also finished the meal with biscotti and Vin Santo, as well as a satisfying tiramisu. Trattoria 4 Leoni is located at Via dè Vellutini, 1r. One of my best friends recommended this restaurant to me on this trip (it was not around when I previously lived in Florence). We heard it was a popular and young spot so we went for New Year's Eve dinner where they served a tasting menu filled with courses such as lentil soup with foie gras, crispy octopus with beans, cod ravioli, and deer heart tartare. The meal was great from start to finish, and the restaurant executed a beautiful service. In addition, Il Santo Bevitore is spirited and lively, with many attractive young Italians enjoying themselves. We liked it so much that we decided to go back from my birthday dinner. We started the meal with prosciutto, salami, and aged Pecorino. Paired with bread and high quality olive oil and balsamic, this was the perfect beginning to a great meal. We also became enamored with Vermentino wine, an Italian grape that has citrus and mineraly flavors with a very smooth finish. One of the best dishes of the entire trip was the Shells with monkfish, broccoli, tomatoes, and squid ink breadcrumbs. The garganelli with zucchini, onions, and tomatoes was also a hit. The food at Il Santo Bevitore is sophisticated, and a bit more refined than some of the other spots in town. The atmosphere is vibrant, and I can't imagine not having a great experience at this establishment. Reservations are definitely recommended. Il Santo Bevitore is located at Via Santo Spirito 66r. Throughout our week in Florence I planned most of our meals and reservations. One day that we were visiting we decided to shop a bit around Via Tornabuoni, and I asked the concierge for a great lunch recommendation and they led us to Cantinetta Antinori. It's a classic little spot with two floors, and a very traditional Tuscan atmosphere. We arrived around 2PM and the place was packed, with no more availability for the day (thank goodness our concierge had reserved us a table in advance). I absolutely loved the plating of the dishes, and the actual plates themselves were beautiful with the restaurant name inked on them. I had the pappardelle with ragu, and the ribbons of pasta with the meat sauce was perfectly done. I also splurged on the warm pear pie for dessert which ended up being one of my favorites of the trip. It was finished with a drizzle of creme anglaise which went well with a cappuccino to end the meal. Cantinetta Antinori is located at Piazza Antinori 3. Located just steps away from the Four Seasons Hotel, this restaurant remains incredibly popular in Florence. It was the place to take your parents when you were studying abroad, and it is still the place to go for a nice upscale meal in town when visiting. The restaurant is quaint and romantic with candles and white twinkling lights. They always start each meal with a glass of Prosecco for each guest, and my friend Holly and I had crispy fried artichokes drizzled with lemon as our appetizer that evening. We both enjoyed pasta for dinner: the potato tortelloni with a Tuscan ragu, and the tagliatelle funghi porcini. Homemade pastas with simple yet classic sauces made dinner at La Giostra wonderful. They are also known for their pear and cheese ravioli which is one of their specialties. We loved our desserts of tiramisu and a warm apple cake. La Giostra is located at Borgo Pinti, 10. This modern and sleek restaurant sits directly next to the Ponte Vecchio on the Arno River, and the views are not to be missed. It's an attractive space lined with vibrant artwork, bottles of wine, and on a nice day the sun is seeping in through the window-lined wall. We really could not get enough of the breasaola salads served in Florence with arugula and Parmesan. I wish there were more Italian restaurants in the U.S. that offered this on the menu. I also loved the ravioli quattro formaggi. It was creamy, and decadent, but the portion size was perfect and left me very content. We also came back to Golden View one night for dinner and enjoyed basics like spaghetti pomodoro, filet with an arugula salad, and pasta with seafood. Golden View Open Bar is located at Via de Bardi 58/r. This was one of my favorite spots when I lived in Italy. Ten years later I still find myself dreaming about the paper thin eggplant Parmesan that was crisped along the edges and melted in my mouth. It's not a fancy place, but it's warm and inviting, and the food is consistently wonderful. In fact, the waiter I had on this trip was the same waiter I remembered from a decade ago. It was during this dinner that I finally enjoyed one of my favorite Tuscan dishes-- pappa al pomodoro. A thick tomato and bread soup that is only served in this region of Italy, and something that I often crave but is hard to locate on a menu in the United States. The soup was thick and substantial as I had remembered, and really hit the spot. We also enjoyed a carafe of Chianti Classico with the meal, which helped to warm us up on that cold evening. The eggplant was everything I remembered it to be! It was nostalgic and wonderful to be enjoying it a decade later. Trattoria Mamma Gina is located at Borgo San Jacopo 37/r. Other restaurants that I recommend considering include Buca Lapi, Trattoria Mario, and Pandemonio. Also don't forget to stop for some gelato at Gelateria Santa Trinita or Grom. In Florence there is not a bad meal to be had, and it is a very special place. I ate and drank my way through the city, and fell in love all over again with the people, the energy, and the flavors. It was an amazing trip and a wonderful way to close out 2013 and enter 2014. Happy travels!